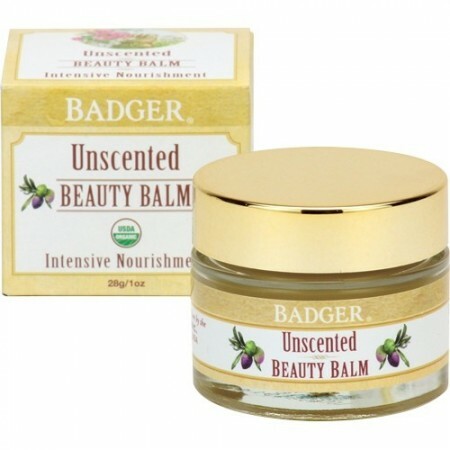 Badger's unscented Beauty Balm is a nourishing treatment for face, neck, and under eye area. Great for hands, too! Formulated with certified organic Beeswax and antioxidant-rich oils, this super-emollient and easily absorbed beauty balm keeps skin soft, smooth, and happy. No added fragrance for sensitive skin types. 28g. 28g (1oz). 4cm height x 5cm width. *Helianthus Annuus (Sunflower) Seed Oil, *◊ Olea Europaea (Olive) Fruit Oil, *Cera Alba (Beeswax), Tocopherol (Sunflower Vitamin E), *Rosa Canina (Rosehip) Fruit Extract, *Hippophae Rhamnoides (Seabuckthorn) Fruit Extract, *Calendula Officinalis (Calendula) Flower Extract. Works well while having no strong irritating scent.